It’s funny the things you begin to look forward to once you become a parent. Before learning that I was going to become a dad, I never would’ve thought that I’d so anticipate being one of those parents seen pulling a child carrier behind their bikes. Now, however, what used to look like a chore before becoming a dad, is now a great excuse to get some new bike related swag! 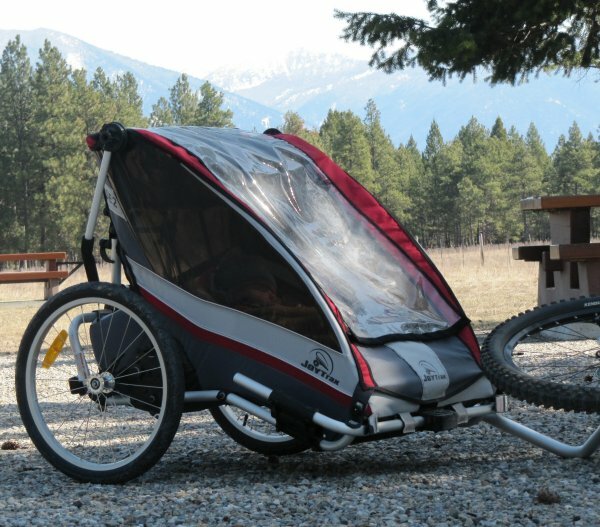 As cycling parents, behind-the-bike child carriers make perfect sense for transporting kids around, so when our baby girl was born, my wife and I couldn’t wait to go shopping for a child trailer to tow behind our bikes. After some looking around, we settled on the Joytrax SE2. Since our baby was too small to place in the Joytrax right away, (they were relatively new to the child carrier scene and did not yet offer the needed accessory to safely and comfortably carry a newborn baby,) we had to put the trailer away in the shed for the winter. I spent that rest of that season eagerly awaiting the spring, realizing more and more just how fun it was going to be to pull my little girl around in that sleek and sporty looking little red waggon! The infant supporter we ordered with it was only good once baby had gained ample head stability and was strong enough to sit herself up mostly on her own. About 5-6 months, which for us worked out to be the beginning of March, just as the sun was really beginning to shine and the roads were drying out! To be honest, during the early months of a babies life, it really is a lot easier to walk her in a narrower stroller that is higher off the ground, as the 2 seater chariot is a bit too wide to walk around the grocery store or the coffee shop for example. In this light, the lack of newborn carrying capacity was not a real concern for us when it came to choosing the Joytrax, though it might be for other parents. Chariot brand carriers, after all, do offer baby slings and bunting bags for carrying newborns. The first time we took the trailer out, I was half expecting it to be a bit of a grind. We have some hills in our little mountain town, and the bike legs aren’t that strong first thing in the spring, but pulling the Joytrax proved to be almost effortless, even when climbing hills. 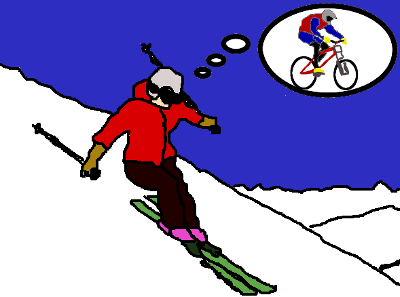 Of course you feel it when you first start out, but once rolling I find myself pretty much unable to feel it, to the point that I have to take a look back and make sure that baby is still attached! The negative to this trait, is that even over rough stuff, what the trailer is really doing is anyones guess, unless you happen to be riding along side it, as my wife was when she cringed and gave me hell for jolting the kid through a huge pothole in the pavement, (I really had thought I navigated around it succesfully as I dind’t feel the trailer smash anything. Oops!) Lesson: Be super aware of where those trailer wheels are, as you don’t get much feedback on your end. On another note, the profile of this trailer is very sleek, so it’s also fairly aerodynamic and doesn’t seem to make the bike any harder to pedal into the wind than it would normally be. The Joytrax comes with suspension which works really well, as even after smashing into a deep pothole at 10 to 15 km/h, baby didn’t wake up. The springs are adjustable, so you can start out soft while child is light, and with the flip of a lever, step it up in increments as the trailers load gets heavier. Both wheels move up and down independantly, offering great balance through corners and over uneven terrain. The wider wheel base of the two child carrier lends itself toward stability. 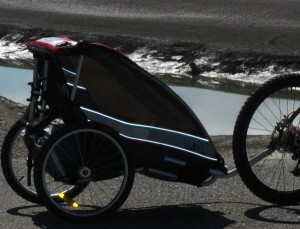 When rolling onto and off the sidewalks at an angle for example, the carrier has much less lean angle than a single child trailer would have. Hooking the SE2 to the bike couldn’t be quicker and easier, and the attachment that remains on the bike when the trailer is detached looks super light and clean. No big ugly chunks of steel hanging off the left side of your axle. The joytrax attaches to the rear axle of the bike using a slick little bracket that must be atleast ten times lighter, and much lower profile than the big bulky knuckle that the Chariot brand uses. Its back plate is thin enough to use your own quick release skewer (A big plus as I really hate using anything other than a shimano QR! ), where Chariot’s trailers need to use the extra long one they provide, which always seems to have an inch of rod protruding from the nut on the other side. That said, it does make you wonder about the strength of it when comparing it to the attachment that Chariot uses. When it comes to the safety of your little ones, we probably shouldn’t be concerned about things such as weight and looks, but for now, after three months of use, there haven’t been any signs of wear on any of the hitch plates or universal joint on the hitch arm. Everything so far looks good, and I ordered a couple of extra ones (their not much money, $20 each) so we can just leave them on the various bikes we will be using too pull it with. All -in-all, a clean design, that works quickly and doesn’t interfere with the bike at all when the trailer is not attached. The SE2 holds up to two children, weighs 22 pounds and has a carrying capacity of 100 lbs. The trailer boasts 2 ¼ inches of suspension travel that’s easily adjustable for stiffness as the load increases by a simple slide of a lever forward or backward beside each wheel. The 20” wheels are spoked, and have poper tires and tubes. They detach easily by pushing a button and pulling them off. In fact, this thing folds down really quite small in just one simple step. flip the two cam levers at the back and slide back the handle and the trailer lowers from 34” to just under 10” (wheels off) imaking it really easy to pack in the car, or store nicely tucked away when not being used. For a full list of features, check out the BX Trailers website. 2) Stronger and more water proof fabric. 4) Aluminum tube inserted in the sides to eliminate wrinkling and create more interior space. 5) Intermediate steel plate in the Axle receiver. 6) Hitch Arm backup strap. For 2013, we are focusing on European distribution. We are currently sold in Germany, Netherlands, Austria, Belgium, Sweden and other countries. Hopefully we’ll be in North America next year. I was very relieved to find out that the product carried on, and that although they were no longer being sold in North America for the moment, the new company has intentions to make their way back here within a couple years. In the meantime, atleast the last time I checked, the previous distributor of Joytrax trailers in Canada still had a decent number of parts and accessories in stock on clearance, so if you purchased one already from a dealer in Canada, you can still get most of the extras that you need if you act fast! All-in-all, my wife, myself and my daughter are all super happy with our Joytrax SE2 (BX Trailers) and see no reason why it won’t be the last child carrier we ever need to buy! I will update this post if anytime we encounter a problem we think people need to be aware of, but for now it has been a great trailer. Canadian retail price was around $700 dollars but you can still find some being sold on clearout for more around the $400 range, which in my opinion is a fantastic deal for what you’re getting. 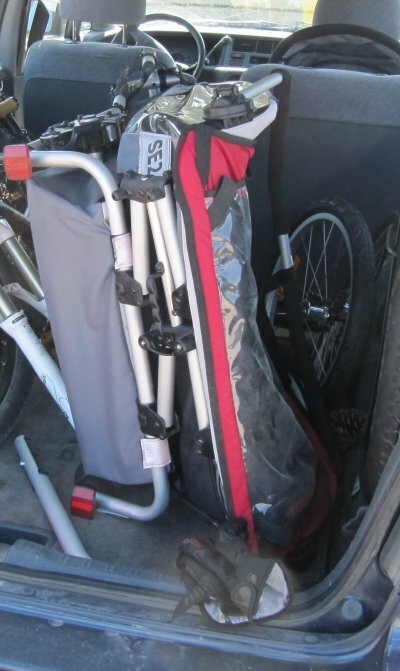 The SE2 places itself very near the top of the line in the child carrier world. Apart from the questions pertaining to warranty and availability of parts and accessories in the future, the only real con I’ve come across when comparing this trailer to some of the other players in the game, such as Chariot and Burley, is that so far there are fewer attachments and add-ons available, the most notable, being the lack of any infant support for children under around the five or six month age group. I’m sure the guys at BX trailers are working on that however, and I hope they will succeed at it. Otherwise, I love the SE2 and highly recommend it! Our family has put the Joytrax through its paces for a full year now, and I have since added an update to this review with a few of the weaknesses that the Joytrax has shown. I highly recommend reading it after you have read the above – mostly positive – review. I want the ‘jogging kit’ for my SE2 double. Where can I have one? Bike was stolen with my joy trax hitch attached. Any suggestions as to where I can get a replacement hitch attachment.